Hometown: Lumberton, New Jersey, U.S.
Died: November 8, 2004 in Operation Iraqi Freedom. Unit: Army Reserves, 443rd Civil Affairs, Battalion, U.S. Army Reserve, Warwick, R.I.
Spc. 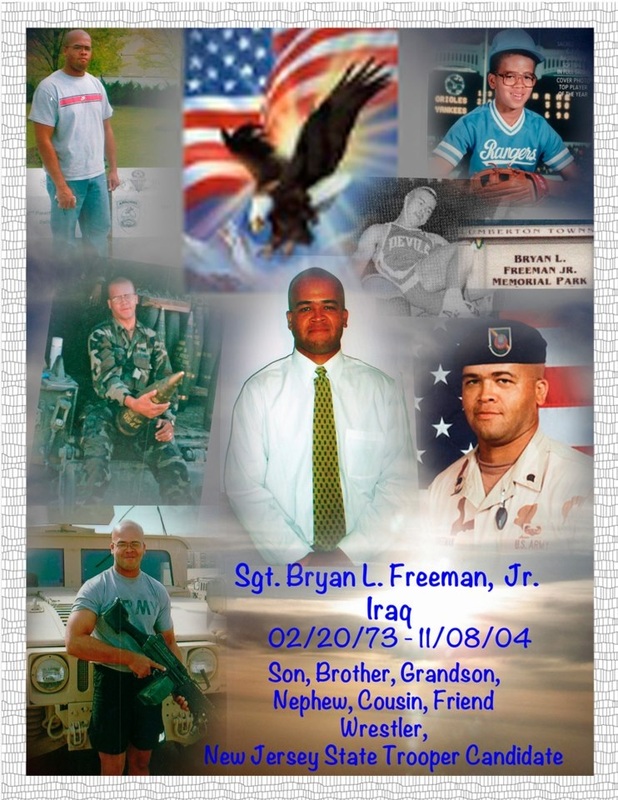 Bryan L. Freeman, 31, of Lumberton, N.J., was a civil affairs specialist assigned to the 443rd Civil Affairs Battalion, an Army Reserve special operations unit based in Warwick, R.I. The 443rd CA Bn. mobilized in August 2004 and deployed to Iraq in September 2004 to support Operation Iraqi Freedom. Civil affairs units support military operations in combat and during peacetime by serving as a bridge between the civilian populace and the military commander. Civil affairs Soldiers help to reduce civilian interference with military operations, restore public safety and order and return societies to normal function. 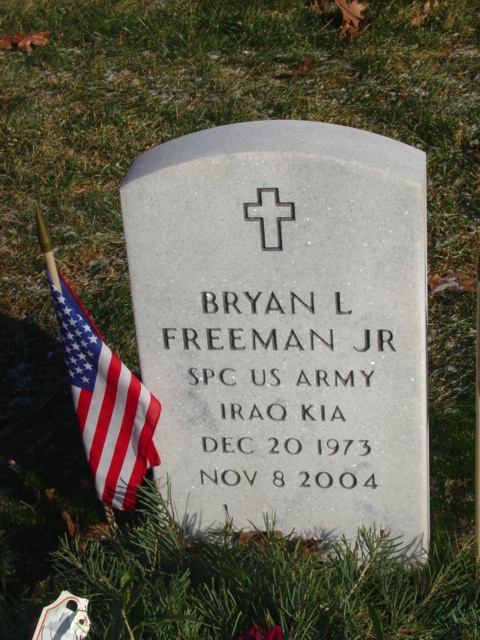 Freeman entered the Army in 1993 and served as a cannon crewmember with Battery E, 7th Field Artillery, Fort Drum, N.Y. He left active duty in 1997 and joined the New Jersey Army National Guard and served with Battery D, 112th Field Artillery, Cherry Hill, N.J. He joined the 404th Civil Affairs Battalion, Fort Dix, N.J., in 2003 and trained to be a civil affairs specialist. He was transferred to the 443rd CA Bn. prior to the unit’s deployment. His military training includes the Survival, Escape, Resistance and Evasion Course, Air Assault Course, Combat Lifesaver Course and Nuclear, Biological and Chemical Protection Course. His awards and decorations include the Purple Heart, Good Conduct Medal, Army Commendation Medal, Army Achievement Medal, Global War on Terrorism Expeditionary Medal, Global War on Terrorism Service Medal, National Defense Service Medal and Army Service Ribbon. In his civilian life, he worked as a clinical case manager with Family Service of Burlington County in New Jersey. He graduated from Rowan University in Glassboro, N.J., in 2001 with a degree in law enforcement. He graduated from Rancocas Valley Regional High School in Mount Holly, N.J., in 1991. He is survived by his mother, Darlene Freeman; his father, Bryan Freeman; and his fiancée, Jackie De Carlo.